Found on Frodsham boot fair today for £3. Six old pence when it was sold for the Coronation in 1937.. The back of the badge with all the wire and gubbins. 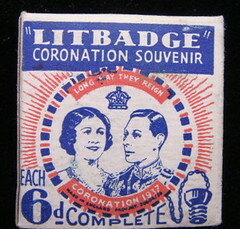 THE ONLY ILLUMINTAED BADGE MADE. 2. 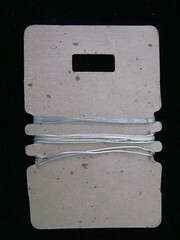 Pull out fuses in turn until the one with the broken wire is located. Found at the Vagrants boot sale near Nantwich last Sunday. "I just want to get rid" he said. 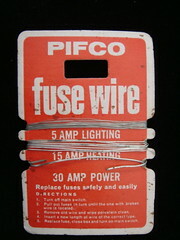 Fuse wire isn't used much now..most people have new fuse boxes which use fuses or have better trip switches. 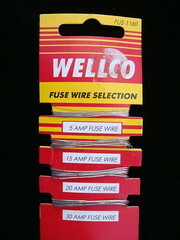 I have quite a collection now of different sorts of wire, packaged nicely on card. 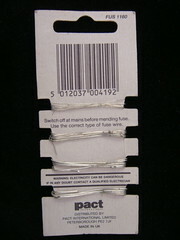 Marketing wire for different occassions. 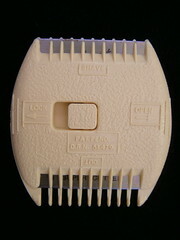 Switch off at mains before mending fuse. 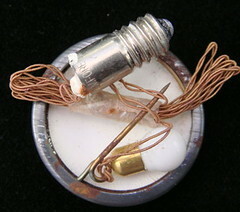 Use the correct type of fuse wire. IF IN ANY DOUBT CONTACT A QUALIFIED ELECTRICIAN. 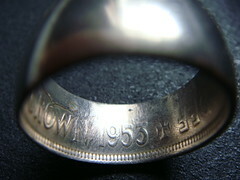 It appears (and I think is) made of a Half Crown coin from 1953. 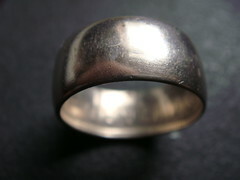 There is a site on the internet that shows you how to make one for yourself and involves many hours of hammering the side of the coin to flatten in out sideways..then drilling through the centre and hammering some more to form a ring with some of the coins inprint ending up inside the ring. Quite a skilled and long job. I had never heard of it before....as a metalworker I am impressed by anyone who could do that. 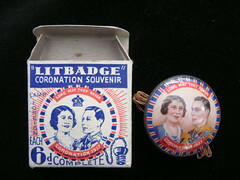 I do not usually put jewellery on this blog, but I think the novelty value of this allows it access. Found on Weaverham Boot sale for £1. A wonderful find for £2 off Hartford boot sale last week. 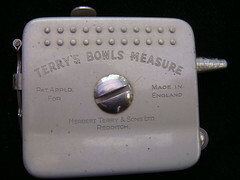 All you need to check the distance of the balls in crown green bowling. I am a little embarrassed to say I lied when I bought it and said I knew someone who played as I didn't know how to explain to him that I just loved it as an object. I love the two rows of dots to give your fingers grip..
and it has an automatic windup. 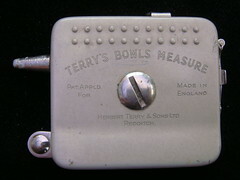 HERBERT TERRY AND SONS LTD REDDITCH. Close up of the end of the measure which pulls out like a normal tape measure, but has no numbers on it..
For measuring small distances..a tiny pair of dividers which slots in the side. The side for Shaving and Cutting. Opened up ready to change the blades. The use of the mirror hanging on a chain dates this to the early 1960s. 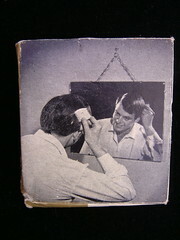 *It takes only seconds to be well groomed. 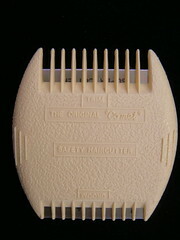 *Protective combs offer complete safety. 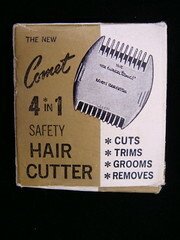 The "Comet" Safety Hair Cutter is unbreakable and fully guaranteed. Each toothcomb is clearly marked :- *CUT - *TRIM - *GROOM - *SHAVE. 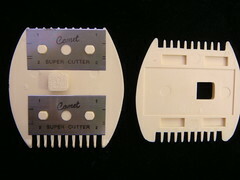 The whole family can use the "Comet" Safety Hair Cutter and replacement Blades are readily available. 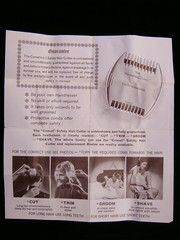 FOR CORRECT USE SEE PHOTOS - *TURN THE REQUIRED COMB TOWARDS THE HAIR. FOR LONG HAIR USE THE LONG TEETH...FOR SHORT HAIR USE SHORT TEETH. 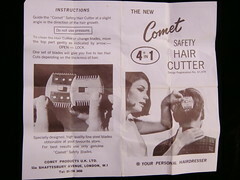 THE NEW Comet SAFETY HAIR CUTTER. Guide the "Comet" Safety Hair Cutter at a slight angle in the direction of the hair growth. 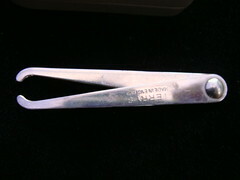 One set of blades wil give you five to ten Hair Cuts depending on the thickness of hair. Specially designed, high quality fine steel blades obtainable at your favourite store. For best results use only genuine "Comet" Safety blades.